The Southern Food & Beverage Museum is a great place to bring your group for a visit. Come explore the history of Southern food, from Maryland to Texas, and learn about the cultural and geographical stories that have affected the food we eat. We'll also dive deep into the history of the unique cuisine found here in Louisiana. If your group has a particular interest, let us know! Tours can be tailored to focus on different aspects of Southern food or drink history. From elementary school field trips to senior groups, our team strives to make your visit fun, informative, and delicious. For groups of 10 or more, we can schedule a private tour of the museum. All tours and demonstrations are scheduled M-F, 10 AM to 4 PM. Any tours scheduled outside this time will have an added $25 per hour fee for each employee. 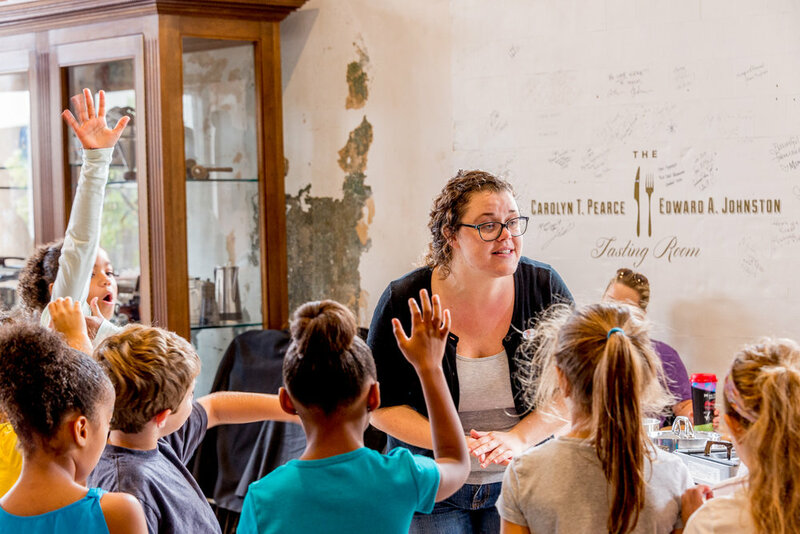 Student tours include admission to museum, introduction, & tour discussing the creation of food and beverage in the southern region through cultural, geographical, climate impacts; cultural exploration of Creole food; difference between Cajun and Creole. Grade appropriate scavenger hunts and other food activities can be arranged for school groups upon request. Adult tours include admission to the museum, a guided tour through each of the Southern states and The Museum of the American Cocktail: New Orleans Collection. Additional topics can be explored with advance notice. Contact Jennie Merrill, SoFAB's Director of Education, to set up your school's field trip or community excursion. Download more information here. Looking for something special for your group? Unable to make it to one of our regular cooking demonstration classes on Mondays or Thursdays? Private demonstrations can be arranged with Culinary Programming Director Jyl Benson! Additions and substitutions can be made with advance notice to take the dishes to the next level (think shrimp remoulade!) or to adjust for a special diet. The demonstration is a visual step-by-step of the main dish and dessert, while SoFAB staff discuss techniques, food history, and the evolution of the food culture in Louisiana. Includes admission to the Museum and a 30 minute guided tour. Contact Jyl Benson, SoFAB's Director of Culinary Programming, to set up your demonstration. The Southern Food & Beverage Museum and the Rouses Culinary Innovation Center by Jenn-Air can be rented for private events, parties, meetings, and more. Please view our Rental Information page here to learn more.